I recently traveled to Oklahoma-- one of the 5 states (MA, RI, TX, OK, and now NY) where I have lived my fabulous life, to welcome my Very First Nephew to the world. 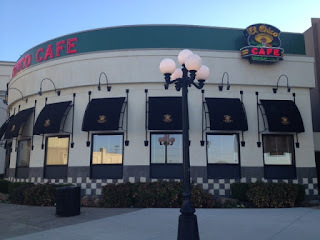 This week's posts are all about the yumminess I got to eat while there. Hey, a girl's gotta eat, even if it's around the very demanding schedule of a baby in no particular rush to get here! While I was initially dragged kicking and screaming (okay, more like sulking and crying) from Massachusetts to Oklahoma, I have to admit the state gave me my love for Tex-Mex and spicy foods (along with some amazing friends whom I still treasure). 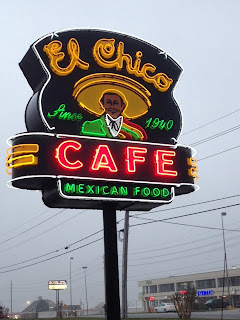 In fact, a chain restaurant still holds the title of best chimichanga in my book: El Chico. I love this dish so much, I actually went there THREE times in one week! THREE. TIMES. Let's start at the beginning though: El Chico is famous for their flaky crispy chips and salsa. The salsa is rich, tomato-ey (sp?) and has a decent, peppery kick. It won't burn off your tongue, but you will feel a nice prickly heat. The chips are the perfect consistency: not too large, just thin enough. 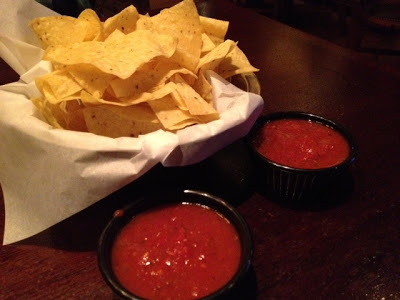 Okay, they may occasionally the break off in the salsa, but I prefer that to crunching through too-thick chips. 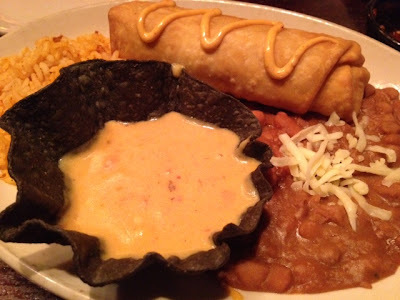 El Chico makes an outrageously spectacular chicken fajita chimichanga. It's filled with seasoned chicken fajita meat, Monterey Jack cheese, and fresh crunchy bits of green jalapeno. The chimichanga manages to be crispy, yet not greasy. The cheesy filling oozes out of it in the most delicious way. 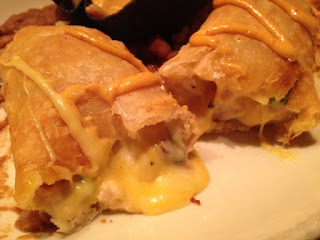 I tried chimichangas at many different restaurants, and they just don't compare to this one. Yes, it's a chain, with locations in several states, but the consistency of the deliciousness is what wins it for me at El Chico. 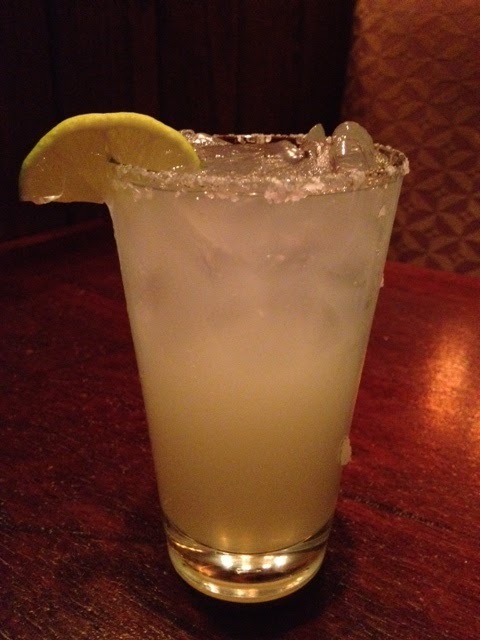 The fact that their house margarita is 20 ounces for $5.55 (!!) that certainly doesn't hurt either! A few days later, my mutha & I slipped out of the hospital for a much-needed meal. My mother told my sister 'Don't you dare have that baby while we're gone,' (she didn't!) and then we zipped down to the Promenade Mall location of El Chico. This place is maddeningly dark inside, but service was quick and efficient. 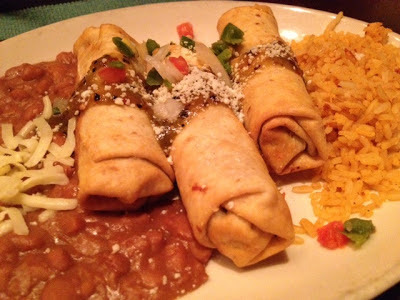 I ordered the same thing: house rita & chicken fajita chimichanga. There's a slight difference in presentation here: no tortilla cup of queso, no squiggle of chipotle on the chimichanga, and the refried beans are puréed (whereas at the BA location, it was half purée, half whole beans). Good, but it's maybe just not quite as cracktastic. I still ate almost all of it, but the Broken Arrow location is the tops to me. 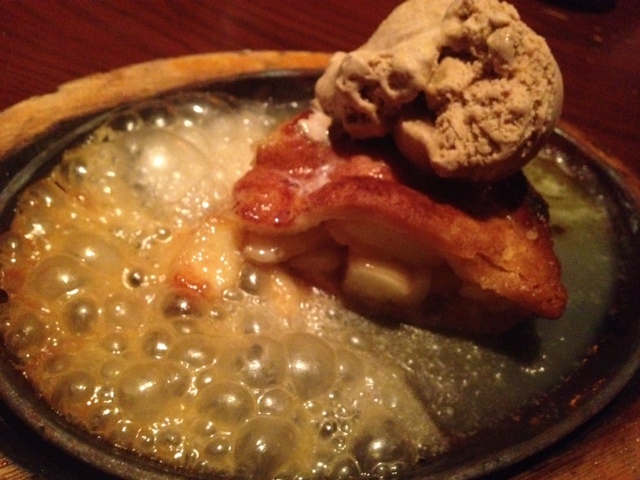 If you have room at the end (and I only did once), share the sizzing skillet apple pie, which has a brandy butter sauce. Craaaaaaaaaaaaaaacktastic! I believe they used to serve it with vanilla ice cream instead of the current cinnamon-- I liked the vanilla version better. Oooh! That brandy butter sauce.. This was my first meal in Tulsa, and one of my last. I went here three times in a week, people. THREE TIMES. 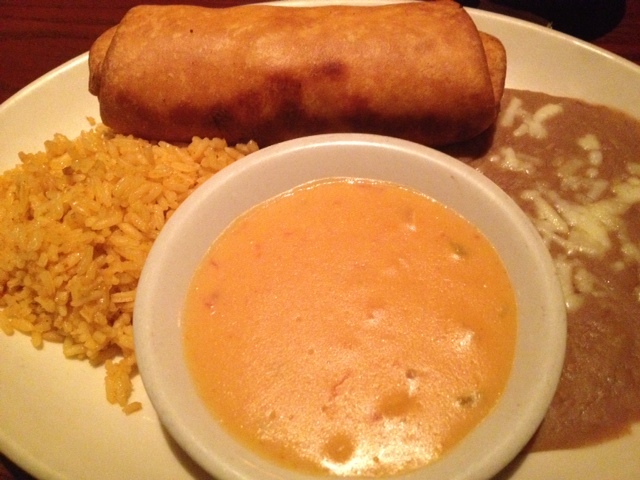 And I got the same thing everytime: chicken fajita chimichanga. ZOMG.